Iran’s "fanatical rulers" pose a nuclear threat to the Middle East and "are on the wrong side of history," Israeli President Shimon Peres said Monday. “In addition to their nuclear option, they [Iran] invest huge capital in long-range missiles,” the Israeli president said. “Iran is not threatened by anybody. Why do they need it” Peres addressed members of the pro-Israel lobbyist group, the American Israel Public Affairs Committee, known as AIPAC. It is the group’s first policy conference since President Obama’s administration took office this year. The Israeli president often criticizes Iran’s leaders, who insist that the country’s nuclear program is for civilian purposes only. Iranian President Mahmoud Ahmadinejad’s recent harangue against the Jewish state at last month’s U.N. racism conference further inflamed tensions with Israel, which is widely believed to have nuclear weapons itself. “Israel stands with her arms outstretched, her hands held open, to peace with all nations, with all Arab states, with all Arab people,” Peres said at Monday’s conference. “To those having a clenched fist, I have just one word to say: Enough. Enough war. Enough destruction. Enough hatred.” Peres praised his country’s close ties with the United States, calling the U.S. “a brave friend” of the Jewish state. He is scheduled to meet with Obama on Tuesday. Israeli leader, Prime Minister Benjamin Netanyahu, will also meet with Obama. Netanyahu’s opposition to an independent Palestinian state has cast doubt on the future of the stalled Israel-Palestinian peace process. Peres sought to reassure the AIPAC conference that the prime minister is interested in peace. “You may know, Benjamin Netanyahu was at one time my political opponent,” Peres said. “Today he’s my prime minister. He knows history, he wants to make history, and in our tradition, making history is making peace. “I am sure that peace is his real and profound priority.” Peres won the 1994 Nobel Peace Prize for his efforts as foreign minister to secure peace, along with Israeli President Yitzak Rabin and Palestinian leader Yasser Arafat. In his speech, he said he believes the Palestinian people “have the right to govern themselves,” but he made no mention of an independent Palestinian state — something that he has voiced his support for in the past. Peres was president under Netanyahu’s predecessor, Prime Minister Ehud Olmert, who supported a two-state solution to achieve peace with Palestinians. Peres stressed that Israel is ready for peace and is prepared to “move ahead as swiftly as possible.” He expressed support for Obama and vowed to “deliver to him a strong message from a country yearning for peace.” “Make no mistake: The present government will abide to the commitments of the previous governments of Israel,” Peres said. 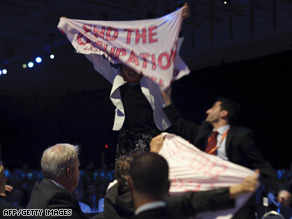 There were several protests during Peres’ speech. In one of them, a man and woman in the audience held up banners with the message, “End the occupation.” They both shouted, “End the siege of Gaza, end the occupation.” The woman stood on a table and held up the banner until someone ripped it from her hand. She took off her jacket and revealed a message, “Free Gaza,” taped to her back. The nearby male protester was wrestled to the floor. Both were escorted out of the conference, their shouts drowned out by applause during Peres’ speech. There were no arrests, and Peres continued his speech, uninterrupted. The woman was later identified as a member of “Code Pink,” an anti-war group that routinely protests conferences and committee hearings on Capitol Hill.